When my proofreaders see this title, they are going to want to fix that dangling participle, "beyond"! They will want to add an object to the preposition — e.g., "live beyond tomorrow" or "live beyond our children's faith" or "live beyond the present generation." Sometimes, however, what a phrase communicates is more important than grammatical correctness. We need to live beyond... I want you to choose the object of the preposition that is right for your life! Whatever holds us captive, we must begin to live beyond the circumstances that limit our thinking, our faith, our focus, and our actions. Yes, life in our world is full of all sorts of immediate demands. Yes, our personal situations press us to make immediate decisions. However, as Jesus' disciples, we are to be led by the Holy Spirit (Romans 8:14; Galatians 5:18). We are called to be different. We are to think, dream, and envision with the eyes of faith: not the limitations of sight (2 Corinthians 5:7). Nowhere is our need to live beyond found than in our parenting and grandparenting. The common assumption is that parents are to live so that their children will have faith. I'm convinced that this way of thinking is shortsighted. As Christian parents, we end up creating this protective cocoon around our children hoping they won't lose their faith. We put them in youth groups designed to keep them interested in church so they won't give up on church and lose their faith. Before long, our approach to our children's faith is about loss prevention. The desire for a bold and passionate living is lost. Also lost is a willingness to teach our children to risk and live life on mission for Jesus. No wonder so many of our children get bored with safe little youth group adventures. Should we be surprised that they have a wanderlust for a life that matters? We forget to expose them to the "wild at heart" kind of faith that goes with the Kingdom of God and authentic discipleship. They yearn to be exposed to life on the edge of faith as we teach them to play it safe. They want to know that their faith means taking risks for what makes a difference in our world. For years, I've advocated, written, coached, preached, and taught that we are to live for our grandchildren to pass on their faith. To me, this is living beyond the moment, the messes, the mistakes, and the everyday mayhem of family life. This kind of living beyond is what Jesus taught in the Great Commission. It is also what Paul taught his apprentice, Timothy. In the Great Commission, notice that Jesus didn't (just) say go make disciples baptizing them and teaching them what he taught. While those words are all in Jesus' commission, this listing of words leaves out a crucial concept. In every generation, Jesus wants his disciples to live beyond what normal religious folks teach and do. Jesus advocated something far more important than a loss prevention approach to our children's faith. He challenged us as parents, as church leaders, and as members of God's family to approach life, church, and our personal preferences from this living beyond perspective. Are we living in our family, are we doing church, and are we as members of God's family thinking about what we do and say and its impact on our grandchildren passing on their faith? Jesus taught every new generation of disciples to go make disciples baptizing them and teaching them to obey what he taught (Matthew 28:18-20). The Great Commission is about investing in new disciples so that they are equipped to teach someone else to make disciples. The work of the Great Commission isn't fulfilled with a confession of faith, a person dripping wet from the waters of baptism, or a person who can quote Scripture. Our work isn't done until new disciples can train other new disciples to pass on their faith. That's living beyond just the coming generation to have faith. You then, my son, be strong in the grace that is in Christ Jesus. And the things you have heard me say in the presence of many witnesses entrust to reliable people who will also be qualified to teach others (2 Timothy 2:1-2). Paul as the original speaker of Jesus' message. Timothy and the many witnesses who heard him. Who would entrust that message to reliable people. Who would then teach others to do the same. I imprint this message on my children — physical children and children in the faith. I live to help my children imprint this message and the way to pass it on to my grandchildren. Nowhere is our need to be living beyond than in our parenting and grandparenting. So that my grandchildren — physical grandchildren or children in the faith — can pass on their faith to their children. Is this living beyond important? With all my heart, I believe that it is. I only wish I had come to this conviction a little earlier. Hopefully, I would have done a few things differently. However, I still have a close relationship with each of our children and hope I am influencing them to live beyond. God has also blessed Donna and me with two precious grandsons. These days I think a lot about legacy. What do I have that I want to pass on through my children to my grandchildren? Certainly I have always wanted my children to have faith. However, this was never a loss of faith prevention plan. Instead, passing on faith was a regular prayer and an ongoing focus. 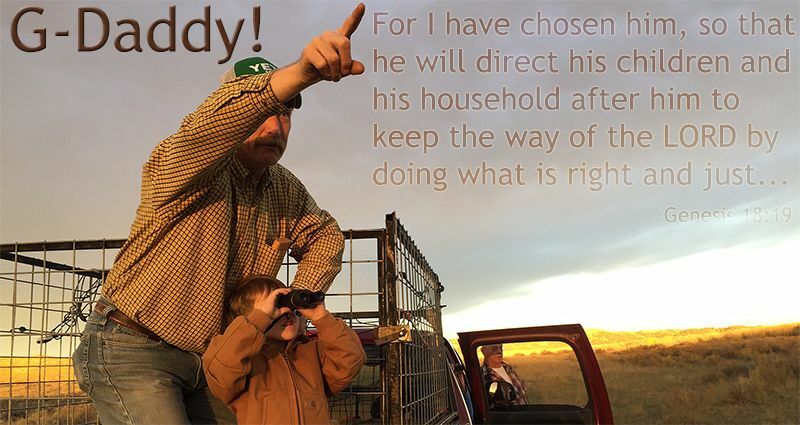 Now that we have grandsons, living beyond is our passionate desire to leave a legacy of faith for our grandsons to pass on to their children and grandchildren. Does this living beyond principle matter? I believe that it does for my children as much as it does for me. As we shared Thanksgiving this past week, we also shared family Christmas. We were together at our son's house. We gathered as a family with our son and his family, our daughter, and a daughter in faith from China. Our daughter-in-law is a precious and devoted mom and a vibrant disciple of Jesus. She and our son made personal gifts for Donna (Nonnie to our grandsons) and me (Daddio). 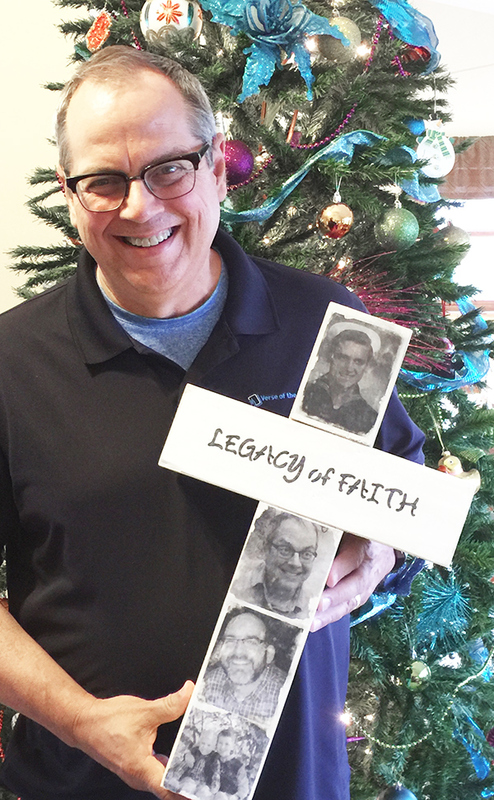 When I unwrapped my gift, it was a big white cross with "Legacy of Faith" written across the crossbeam. It had pictures of my dad (Daddy Al who passed away when I was 25), me, our son, and our grandsons down the long vertical beam. I couldn't ask for a greater gift. They captured in this gift the essence of my life's primary work! They came up with the idea because they know my passion of wanting to be a person living beyond the immediate moment and the current generation. They knew I wanted our grandsons to not only have faith but actively to pass it on. When I graduate to the presence of Jesus in death, I hope to leave behind some Bibles for my grandsons, some traditional bows I've taught them to handle responsibly, some great memories of loving moments together, and a special white cross that reminds them that it's their turn to be men committed to live beyond! "Live Beyond" by Phil Ware is licensed under a Creative Commons License. Heartlight encourages you to share this material with others in church bulletins, personal emails, and other non-commercial uses. Please see our Usage Guidelines for more information.